OK. Despite the fact I like most of these foods, I never know what’s different about them. My family had this rice-with-little-things-in phase and ALL of these foods had the same concept; rice with little things in. The reason for this was because our oven wasn’t working and Dad got a lot of ready meals. It basically coordinated between rice-with-little-things-in and ready meals. Dad answers, “They’re nothing alike! Just look at them!” That hint doesn’t help much, as they all have the same rice, same look (sticky brown rice with mushrooms and sometimes prawns or sausages in). I just don’t know what the difference is! Should risotto, jambalaya, paella and biryani be classified as the same? 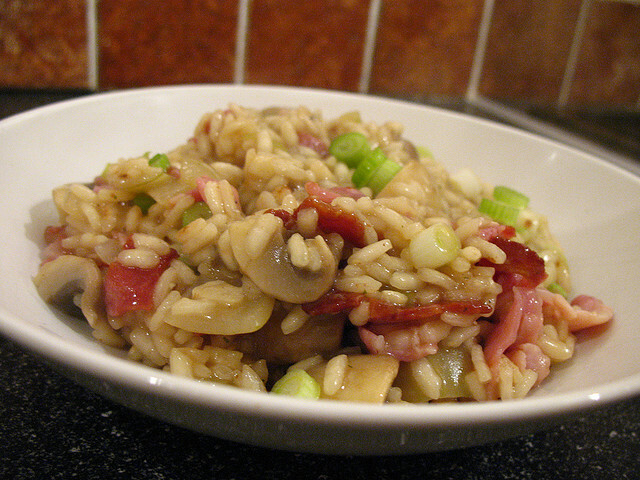 ‘sticky brown rice with mushrooms’ — I love rice, but I’m not sure I love rice being too sticky though. What makes them so sticky? I normally have plain rice, or fried rice. I think it takes a lot of effort to cook risotto, jambalaya, paella and biryani and I can’t even pronounce these names properly. Based on your descriptions, perhaps they indeed can be classified as the same! Thank you for introducing these interesting dishes to me. Hi Ben – Love the blog, but not too sure of your reasoning on this one. Sure, the rice may look the same but the taste is completely different – and it is the taste and not the appearance that determines what the dish is. I am a big fan of ready meals and can really recommend Tesco’s Jambalaya. Tesco also used to do a great Tex-Mex lasagne but they stopped it because I was probably the only person who bought it. Anyway, if we extended your line of thought, then all black dogs would be labradors because they look the same from a distance. This would not please Nina very much because she is very proud of being a German Shepherd and would be most offended to be taken for a dopey labrador like Wes. Keep up the good work. I have bookmarked the page so will check in most days. I will be doing an article on dogs soon and will include Nina and Wes in. I really don’t know the difference in taste much but I do remember that at least 2 were different taste and jambalaya had prawns in. Think you could start a major argument in Spain. Paella is different! Biryani tends to be spicier. The main difference is in the rice. Paella uses Bomba rice, from the Valencia region of Spain, which is different to risotto rice or long grain. It’s a huge thing in Spain – the quality of the rice and where it’s from. I asked if I could use Bomba rice for a Spanish rice pudding and was told that Bomba rice is only for paella. They are all delicious though. I love jambalaya too! Thanks for your comment! I’ll tell dad about the information, and make sure that he uses the right rice for his cooking! I also like jambalaya.